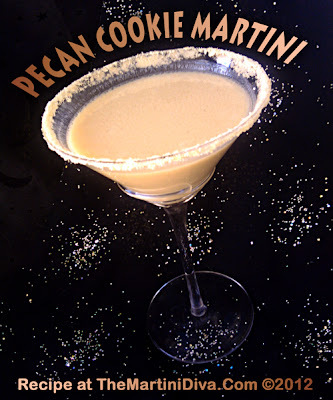 National Pecan Cookie Day is a perfect excuse to pull out my bottle and create another martini using my recipe for Candied Pecan Liqueur. I did myself in when I created that liqueur because I love it, my Happy Hour friends love it and I can't just run to the liquor store and pick up a bottle, lol. It is easy enough to make, you just have to be patient for the results and let it infuse for a few weeks! It uses my recipe for Candied Pecans (Nuts) and both that and the recipe for the Candied Pecan Liqueur are HERE. This time I got to rim the dish with a favorite cookie of mine from childhood - Pecan Sandies. These were one of the only "store bought" cookies ever to grace our cookie jar when I was a kid because my mom loved them. As a result we got a lot of these cookies because they didn't require my working mother to spend an hour or so over a mixing bowl and a hot stove after schlepping home from work! Funnily enough I picked up a package of them the other day in a fit of nostalgia - I had no idea how handy that little bit of food memory indulgence would be a few days later!